To make meatballs, combine all ingredients in a large bowl and mix well. Roll into balls around the size of a golf ball and place on an oiled baking tray. Bake for around 15 minutes or until cooked through. Meanwhile, to make salad, spread seeds and almonds over a large oven tray and toast in oven for around 5 minutes or until lightly browned. Mix seeds and nuts together with rice and quinoa, cherry tomatoes, parsley and lemon zest. 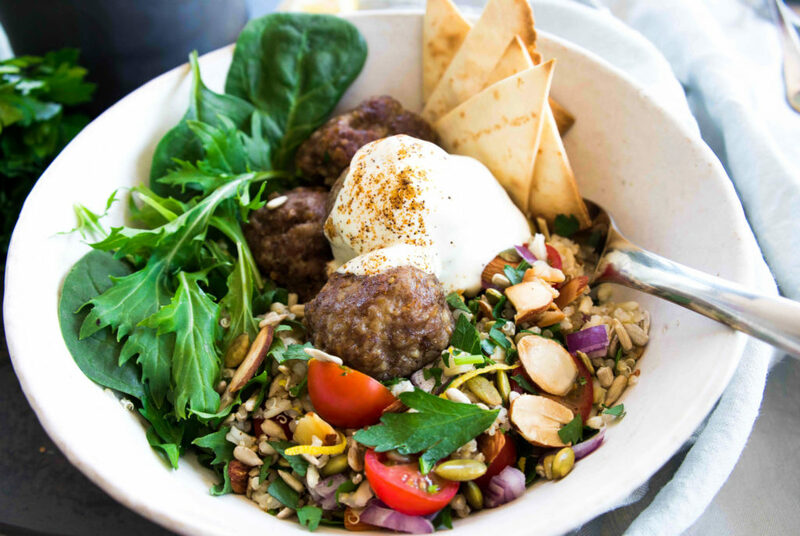 Divide salad leaves and rice/quinoa mixture between serving bowls, top with meatballs and arrange pita bread triangles around sides of bowls. Spoon tzatziki over salad and serve with lemon wedges.